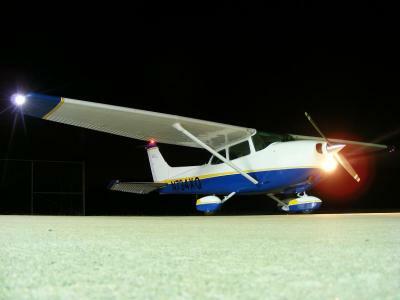 The night after my father and I had purchased this aircraft I wanted to get some good pictures. This night shot was done with a Fuji FinePix S700. Trying to be creative (and not having a tripod) I set the camera on the ground, set the camera to Shutter speed priority (as low as possible). This has not been Photoshop-ed at all and I would love as much feed back as possible, good or bad. I think Nic has done a great job here, certainly from a technical point of view. Nic must also have used a reasonably small aperture – you can tell this by the “starburst” effect on the wing light. This is a nice effect for this sort of photo – makes it look a little more dramatic. Although no Photoshop-ing has been done to this photo, I think the area beneath the wing could be cleaned up. There are some buildings in the background there that detract a little from the rest of the photo. There’s only one thing stopping me from loving this photo – it’s all a bit, well, “standard”. I don’t have any aeroplane catalogues to hand, but if I did I suspect it would be full of photos like these. Nic mentioned that this photo was taken the night after the plane was bought; jointly with her father. I think it would be nice to have Dad in shot too. What if Dad stood proudly in the foreground, large in the frame, in the left of the photo? It would make the photo more personal, and it would also add depth to it. And because you would be using a small aperture both he, and the plane, would be in focus. Sure you would lose the wing (it would be behind him), but I think it would improve the shot. That’s my take on it. Really good shot though, and as I said at the start, technically spot on! – Ed. Just wanted to say I like your photo. something that wasn't mentioned by ED is that you took the photo at night, not in the daytime. I don't know if that was deliberate or not, but I think it has improved your photo. If you had taken the photo in daylight we would have had a blue sky, and no lights. By taking it at night we get a black backdrop, and nice twinkly lights. I wanted to mention this as taking pictures at night can add a whole new dimension to photos, as your photo shows. This poster is absolutely right. Taking photos at night really can add something special to photos. 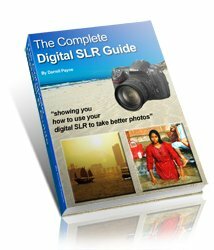 You can get more digital night photography tips here.